JEE mains chemistry exam includes topics on Physical chemistry, organic chemistry and inorganic chemistry. There are total 28 chapters for this subject. JEE advanced has the same topics with different gravity of questions. 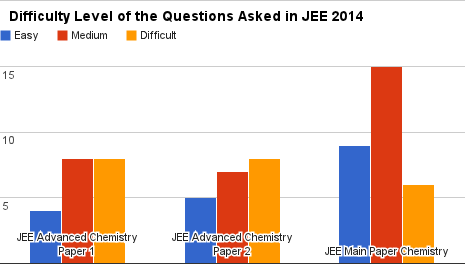 For paper JEE Mains the medium level questions shot up high whereas difficult level questions were least asked thus giving the impression that medium level question should be the main focus. For JEE Advance paper 1, chemistry the level of questions asked was mostly medium and difficult level. Thus lot of practice is required to crack such a paper. In JEE Advance paper 2 there was a gradual incline in the level with difficult level being the highest. Here an all rounded approach is the key where all level questions should be practiced thoroughly before the paper. The above graph will help you to understand which questions to give first priority. The sure shot way to success is to go through lot of doubt clearing sessions online and practice questions thoroughly.